Special couples and guests are encouraged to register for this FREE Wedding & Event Expo! 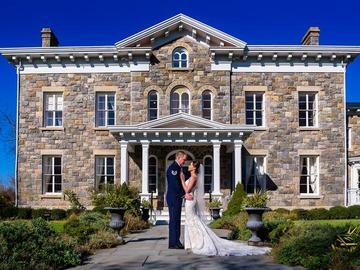 Greenport, NY – Brecknock Hall is excited to announce its Second Annual Brecknock Bridal Boutique Wedding Showcase FREE to guests looking to host a wedding, celebration, or other event. Taking place Saturday, April 6 from 12 PM to 3 PM, the boutique will feature the donors who have contributed to the Veterans Day Wedding Giveback. Whether looking to host your wedding at Brecknock, a vineyard, or another East End venue, surround yourself with more than 30 local vendors to discuss your vision and help you to plan your special day. "The North Fork wedding industry is exceptional as all of these vendors know how to come together to deliver a truly spectacular day for the special couple," said Valerie Tirelli-Hallock, Sales & Events Coordinator for Brecknock Hall. "These vendors have the knowledge and creative know-how to take your vision and run with it, working within your budget to deliver first-rate services." All brides, grooms, families, and friends are invited to have the opportunity to interact with wedding planning professionals including area photographers, florists, make-up artists, hair stylists, caterers and more. Select vendors will be offering incentives to couples who book services during the showcase. Fun offerings are also being planned to both enlighten and entertain attendees. The day's events will feature mimosas & food samplings, raffles and a Bridal Fashion Show courtesy of North Fork Bridal Shoppe. Creative and locally inspired wedding favors will be on display, with photo booth, floral & food inspirations sprinkled throughout the event. Participating vendors to –date include: A Flipping Good Time, American Tent Company, Beautiful by Katy & Dina, Christopher Michael Catering, East End Events Catering, Kim Jon Designs, Leanne's Specialty Cakes, Make Some Noise DJ's, Massage Me by Sara Leonard LMT, McBurnie Tent Company, North Fork Bridal Shoppe, North Fork Box, and more. Guests are asked to register at https://peconiclanding.ticketleap.com/brecknock-bridal-boutique2019/. The first 50 guests to register will receive a free swag bag! For questions, please contact Valerie Tirelli-Hallock, Sales & Events Coordinator for Brecknock Hall, at info@brecknockhall.com.